For the best deals on accommodation in Cairns see our huge selection of packages that will save you time and money. Overlooking stunning Trinity Bay, Breakfree Royal Harbour offers self-contained apartment accommodation surrounded by parklands and the Cairns Lagoon. Enjoying private balconies with views of the gardens or waterfront, the resort is home to an abundance of leisure facilities and is close to all the local attractions. One of Tropical North Queensland's most popular resorts, the Cairns Colonial Club Resort combines all the comforts of a large hotel with the relaxation of a tropical resort. Cairns Colonial Club accommodation offers Studios and Hotel Rooms surrounded by tropical gardens and a fantastic range of facilities. Accommodation at Cairns Harbour Lights offers stylish waterfront accommodation with spectacular views of the harbour and marina. Enjoying an excellent range of onsite facilities, the resort also enjoys a convenient location close to the region's best shopping, dining, activities and attractions. The self-contained accommodation of Cairns Queenslander Hotel & Apartments offer a comfortable and relaxed place to base yourself and are surrounded by an excellent range of onsite facilities. The property is also conveniently located within walking distance of local activities and attractions and the city centre. Located in the heart of Cairns, Coral Tree Inn offers spacious, comfortable accommodation complete with private balconies within walking distance of the most popular local attractions. Enjoying an excellent range of onsite facilities, the resort is just a short stroll from the Reef Casino and boutique shopping and dining hub. 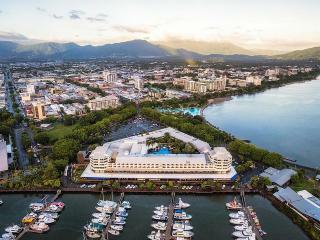 Situated on the Esplanade, Holiday Inn Cairns Harbourside offers modern accommodation conveniently located close to the city centre and a range of local attractions. The Hotel Rooms and Suites enjoy access to an excellent range of facilities and enjoy stunning views over Trinity Bay from private balconies. Located on the waterfront of the famous Cairns Esplanade, the self-contained and well-appointed accommodation of Mantra Esplanade offer the ideal place to base yourself on your next Tropical North Queensland holiday. 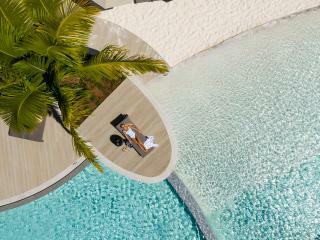 The resort also enjoys outstanding facilities close to the local tourist hub. Offering spectacular views of Trinity Bay, the harbour and surrounding hinterland, Mantra Trilogy features waterfront apartment accommodation overlooking the popular Esplanade. The resort's excellent range of facilities include an expansive swimming pool, kid's wading pool, gym, BBQ facilities and much more. Set on 2 hectares of lush tropical gardens, the picturesque nature of Novotel Cairns Oasis Resort belies its convenient location in the heart of the city. Surrounded by a wide range of local tours and attractions, the resort enjoys its very own beach, a free-form swimming pool, central courtyard and much more. The spacious accommodation of Park Regis City Quays is located on the harbour foreshore and is ideal for those wanting to explore Tropical North Queensland including the Great Barrier Reef and Daintree. The resort is also centrally located to the shopping and dining precincts of the marina and casino and the Cairns Convention Center is just across the street. Located opposite Cityport, the Piermonde Apartments offer luxurious accommodation surrounded by Cairns' best shopping, dining, tours and attractions. The resort also boasts a convenient range of onsite facilities including a swimming pool, deck, BBQ area and outdoor spa in the city centre. Situated in the heart of Cairns city, Pullman Cairns International offers luxury accommodation with breathtaking views of the marina and distant hills. The hotel is conveniently located close to the casino, local attractions and gateway to the Great Barrier Reef, Daintree rainforest, Kuranda railway, Skyrail and more. The Pullman Reef Hotel Casino offers a deluxe range of hotel accommodation in the heart of Cairns city. Part of the casino complex, the rooms offer picturesque mountain and ocean views and an outstanding range of onsite facilities in a convenient location. The 5-star Riley, a Crystalbrook Collection Resort is located on the popular Esplanade, steps from various restaurants, attractions, shopping and the famous Esplanade Lagoon. Consisting of great facilities and sophisticated rooms and suites, Riley, a Crystalbrook Collection Resort welcomes families and couples seeking a luxurious escape in the heart of Cairns. Offering the best of both worlds, Rydges Esplanade Resort Cairns offers 4 star accommodation with a relaxed and casual atmosphere. Just a short stroll to the city centre, the resort boasts beautiful views of Trinity Bay and the mountains as well as a fantastic range of onsite leisure facilities. Offering panoramic views of the mountains, harbour and city lights, Rydges Plaza Cairns features deluxe accommodation in the heart of the city. The resort enjoys a great range of facilities and easy access to popular local attractions including boutique shopping, award dinning dining, the casino, rainforest and reef. Situated on the waterfront of stunning Trinity Bay, Shangri-La Hotel the Marina Cairns offers luxury accommodation with views of the bay and out to the mountains and hinterland. Right next to the Reef Fleet Terminal, the resort shares a complex with Pier Marketplace offering plenty to see and do. Featuring classic accommodation with a distinctive Queenslander style, The Hotel Cairns offers a great range of onsite facilities and a convenient location. Situated within walking distance of shopping, local markets and fine dining, the resort is also close to departure points for Tropical North Queensland tours. Offering 1, 2 and 3 bedroom self-catering apartments, The Lakes Cairns Resort features luxury accommodation surrounded by 11 acres of tropical gardens, picturesque lakes and expansive lagoon pools. The resort is ideally located close to a range of local shopping, dining, tours and attractions. An affordable Cairns accommodation option, Tropical Queenslander offers family-friendly studio rooms with comfortable and modern amenities as well as a great range of onsite facilities located just a short stroll from the city centre, popular Esplanade and a number of local activities and attractions. The self-catering luxury accommodation and outstanding facilities of Vision Apartments are ideally located to take advantage of all the most popular local attractions as well as the famous Tropical North Queensland destinations like the Great Barrier Reef, Daintree Rainforest, Kuranda Scenic Railway and the Skyrail. Enjoying a unique location on the Cairns Esplanade, Waterfront Terraces offers spacious self-catering accommodation with stunning views of Trinity Inlet and the Coral Sea. Designed to reflect the traditional Queenslander style, the resort is within walking distance of the marina, shopping, dining and attractions. The ultimate in luxury on the waterfront, Waters Edge Apartments offer deluxe apartment accommodation complete with modern amenities, full kitchen facilities and spacious private balconies with beautiful views of Trinity Bay as well as the convenience of onsite facilities and plenty of attractions close by.